I have recently switched to an Android phone coming from an iPhone 5 and I totally didn't miss my apple (except for one tiny app I loved the most in iOS - Plant Nanny! - helps me get motivated to drink enough water) due to many cool Android apps which just fits my need. 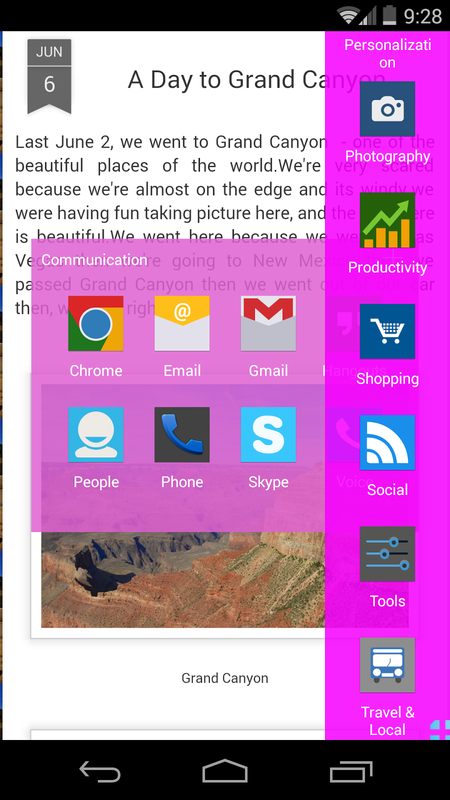 Plus, Google apps runs better with Android as expected. However, since smartphones stormed the planet, I am missing one feature which was usually part of the default settings ages ago - TADA! - the categories. 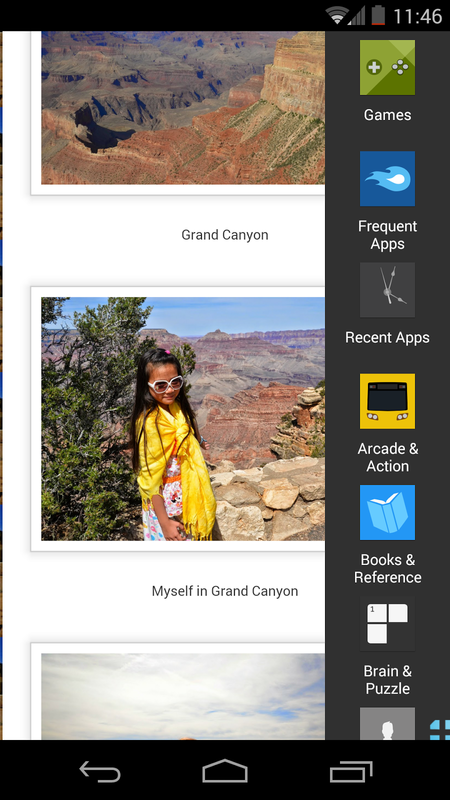 Today's vanilla feature of the Android platform presents apps into a grid of icons spanning into pages as needed - not bad at all - but if you are app-packed, it may take you a few seconds longer to go to that utility app you are looking for. Good thing, there are tons of launcher/organizers out there made by the geeks of our planet (or are they really from around here?!?). 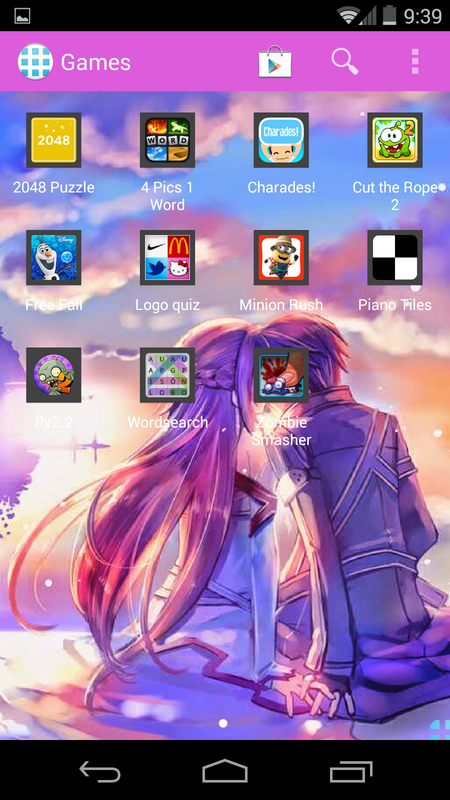 I used to like GO Launcher but later on realized that it has too much features that I don't need. I am just a simple person and the only thing I want is to organize my apps so I can look for specific app I need based on categories - and I wanted it done automatically. 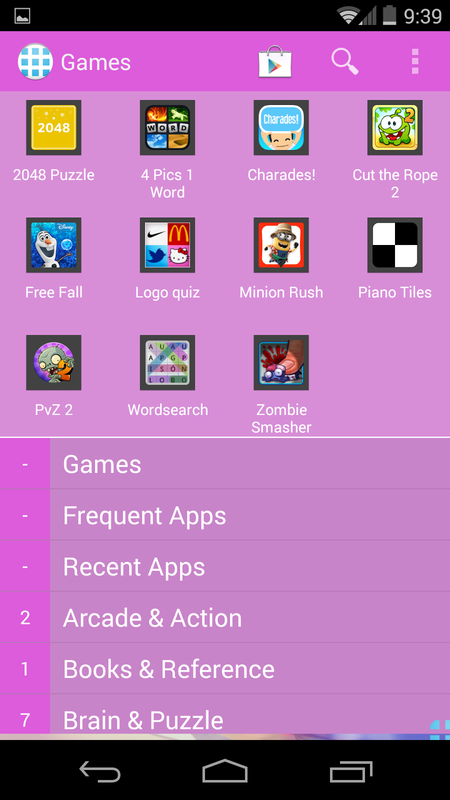 Here comes AppLauncher! 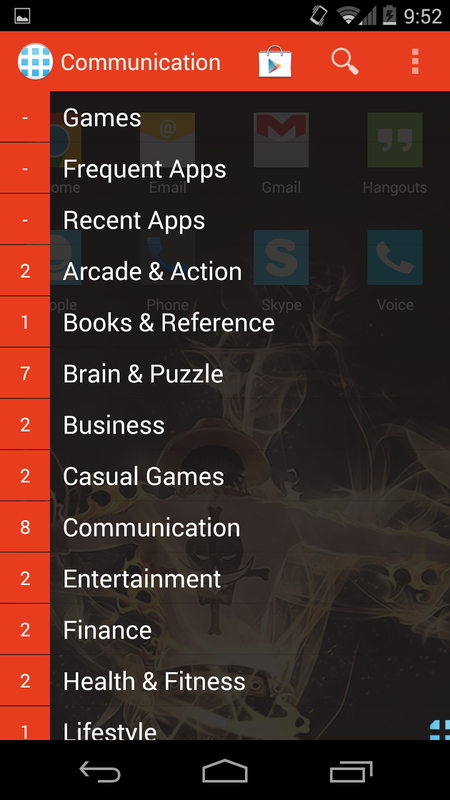 It organizes your apps automatically based on Google Play store categories and lets you do more customization if you want. After selecting a category from the drawer, you will see the narrowed down list under that category - in this shot, it is the Tools category - and I call this view Drawer Interior. Let me say walk you through the features. 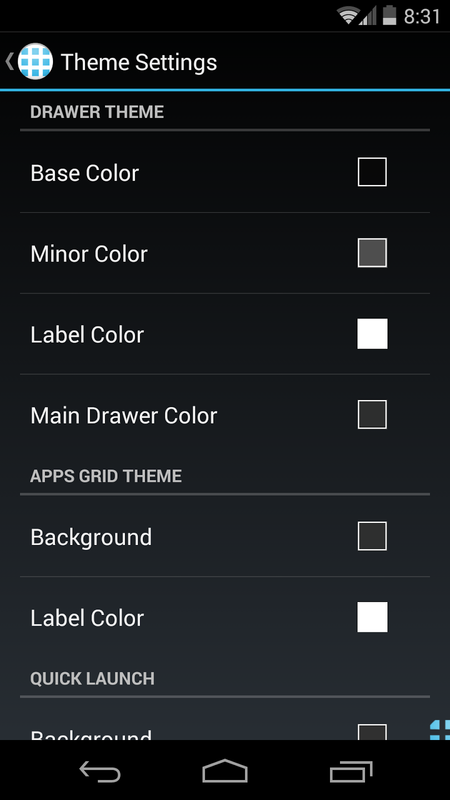 This section lets you play around the colors of the application's key areas: the Drawer, the Grid, and the Quick Launch. You can also apply a background image and enable/disable the old layout as you please. By tweaking the colors and transparency, you can create different themes as your mood/personality requires. 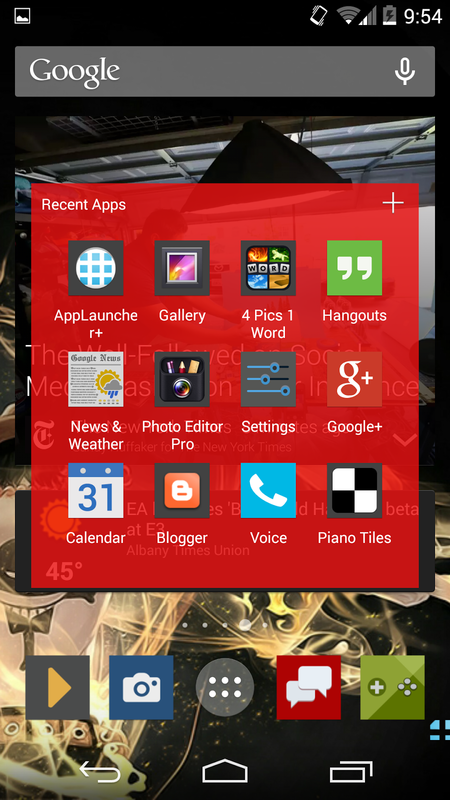 In the following sections, I will feature two themes: Fiery and Girly - please note that these does not come as defaults in the AppLauncher, I just tweaked and named them for easier reference in this article. The "Drawer Theme" decides on the color and transparency of the main Drawer (the one showing category list) and the Drawer Interior (the narrowed down view). These settings are available in Pro Version. 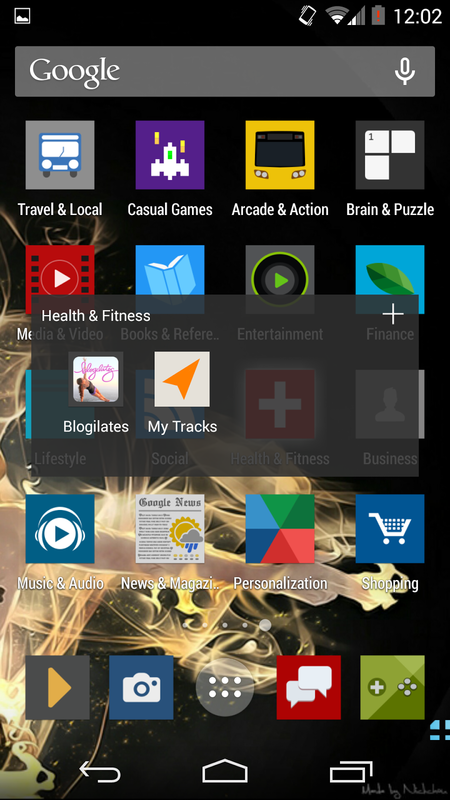 The old layout pertains to the initial version layout of AppLauncher where you have the Drawer and the Interior together in one view. See sample screen below. Old layout drawer in girly theme! 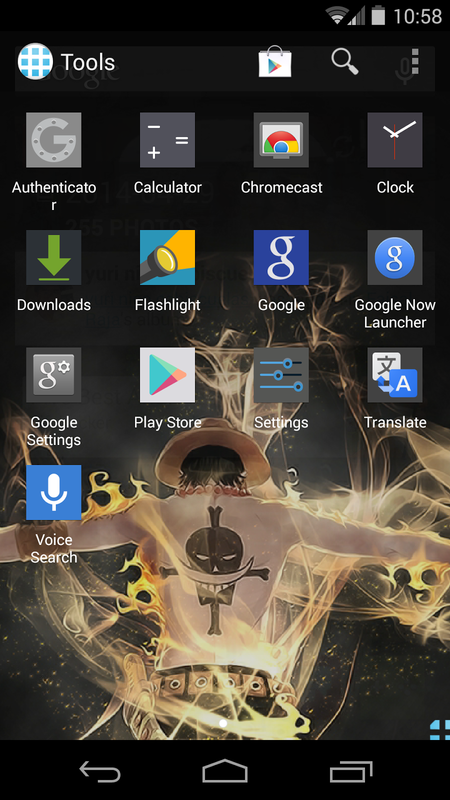 The old layout's color is decided by the "Drawer Theme" settings. Background image is currently not supported in this layout (as of this writing). This setting is available for those who wants further customization in their categories - however, currently, this is only available to pro version. 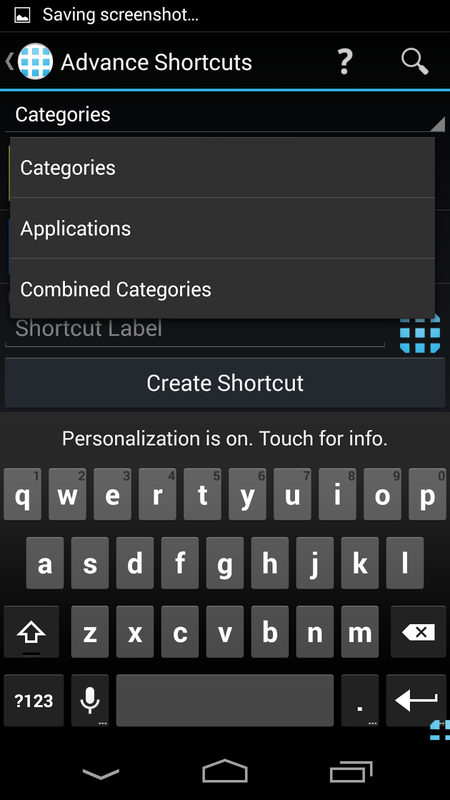 There are three (3) ways to create advanced shortcuts: Categories, Applications, Combined Categories. 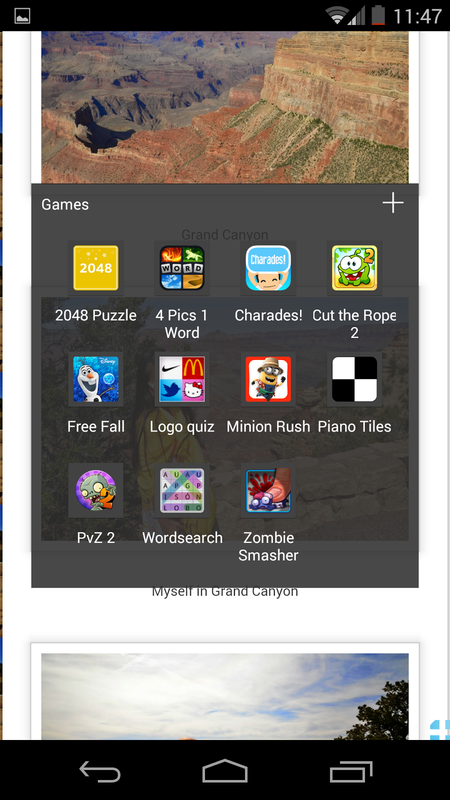 If you want to choose a few apps and make it easily available in one tap, then this is an option for you. 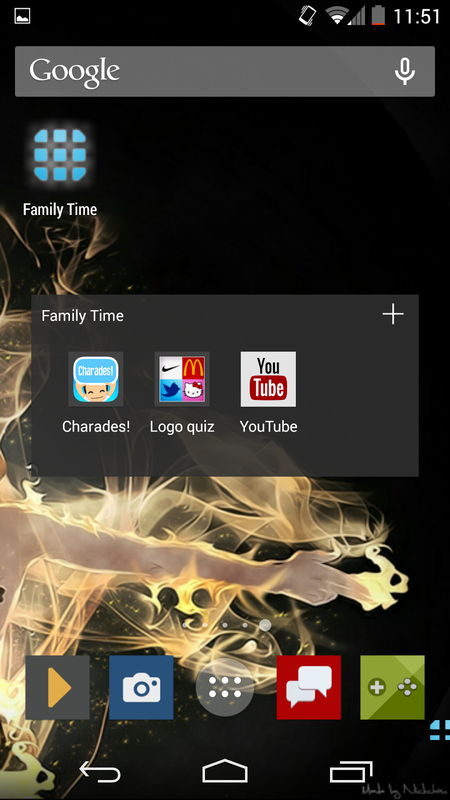 In this example, I created a shortcut named "Family Time" which consists of the apps Charades, Logo Quiz and YouTube. 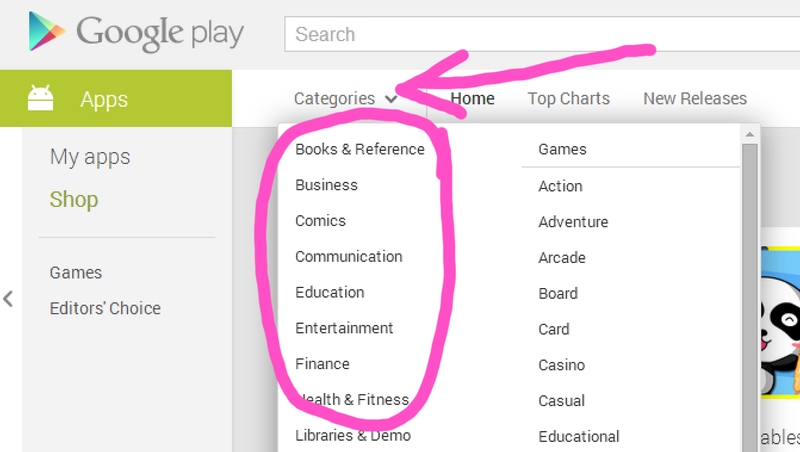 Creating an advanced shortcut of categories lets you group categories into one shortcut. 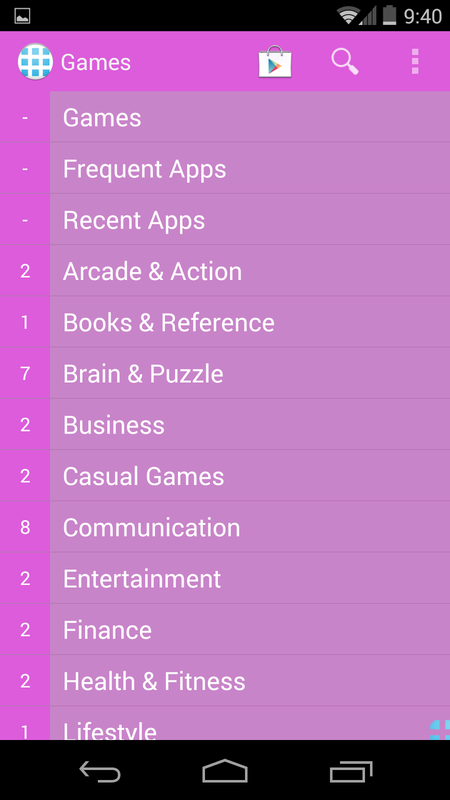 For example, in the screenshot below, I created a shortcut named "Essentials" which launches a grid of categories I consider essential - the Games, Arcade & Action, Brain & Puzzle, Casual Games and Health & Fitness. I don't have a screenshot, but this option lets you group two or more categories into one shortcut. 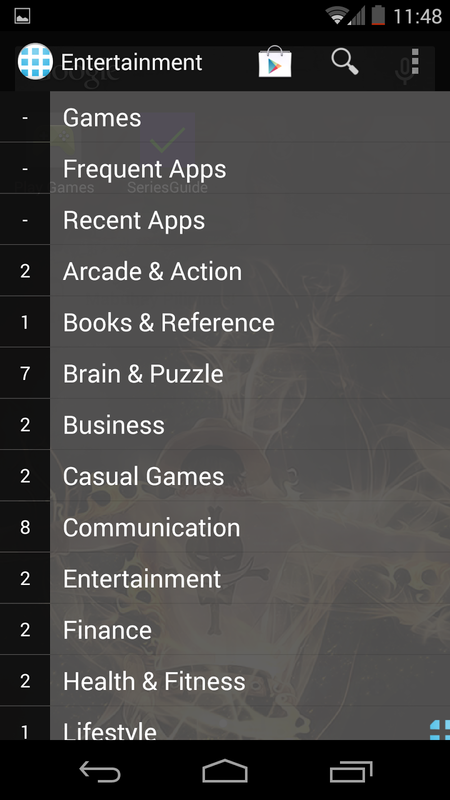 For instance, if you want Brain & Puzzles and Arcade & Action to be grouped into one "My Favorite Kind of Games" shortcut, then it can be done. You will then see your Whats My IQ and Zombie Smash into one category. 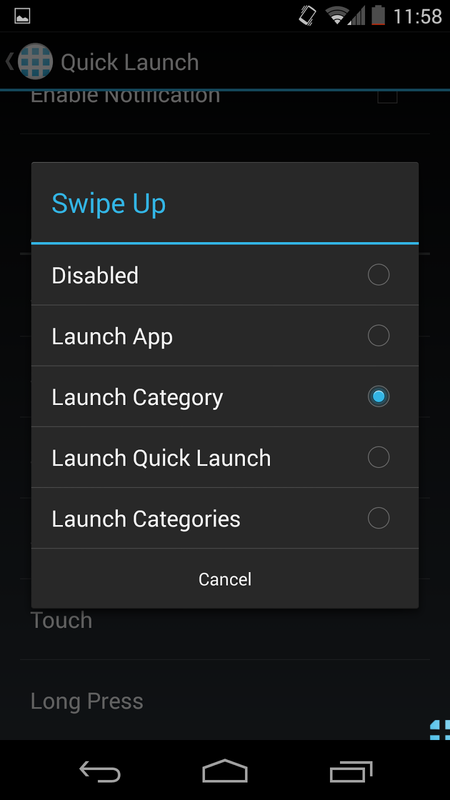 The quick launch enables you to access AppLauncher at any time while using your Android mobile. In my configuration, I can access the Categories Bar by swiping up the icon from the lower right corner of my screen and the Apps Grid by swiping to the left. The quick launch can be customized further under settings. 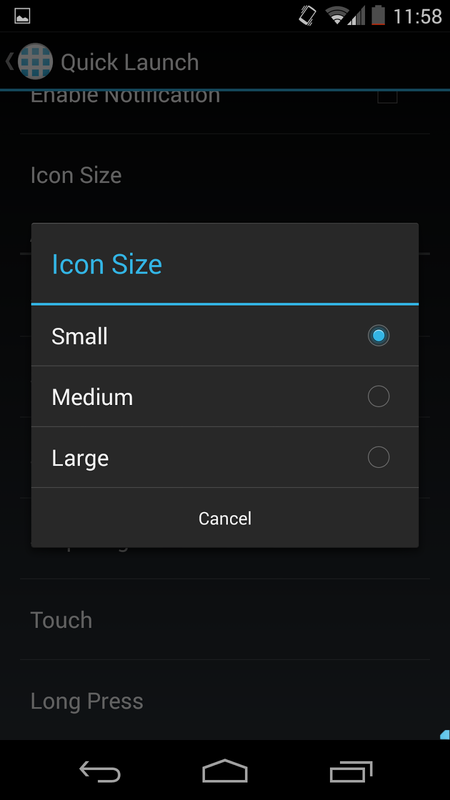 The Icon Size can be changed into small, medium or large size. The actions can be changed or disabled accordingly. 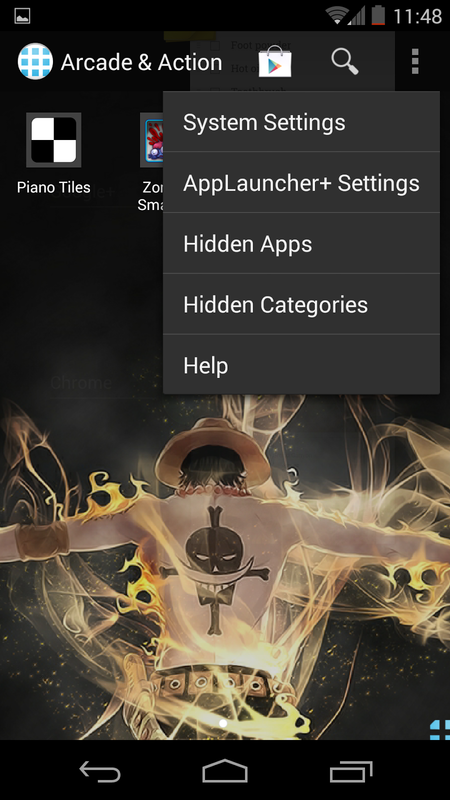 You can also add categories shortcuts into your home screen. 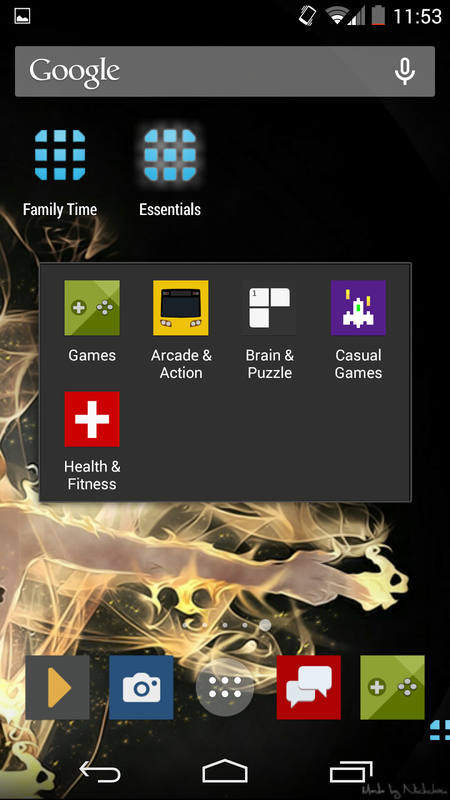 The following image shows all my categories in my home screen with the Health & Fitness shortcut currently selected. One more thing, the icons can be customized. 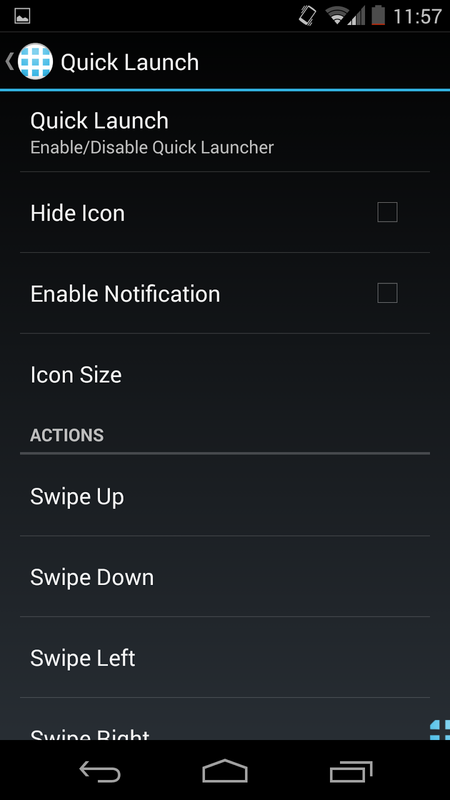 This is specially useful if you have installed icon packs. As of this writing, I know that the geek behind this great app is currently working on a few more improvements to the current versions. 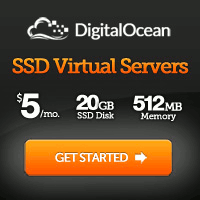 Visit these links for more information.